Sorry... the 2017 GMC Canyon is no longer being sold as new. Instead, take the first step to a great deal on 2019 GMC Canyon with a free price quote! 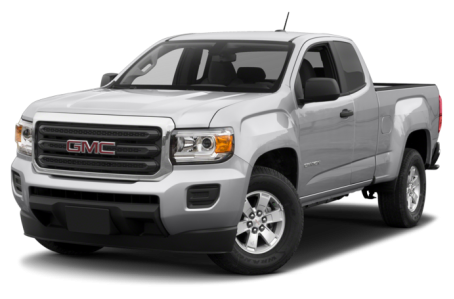 The 2017 GMC Canyon is a mid-size pickup truck that shares the same platform as the Chevrolet Colorado. It has two cab sizes: Crew and Extended. The Crew Cab has a long and short box, while the Extended comes with only the long box. This year, the Canyon gains a new Denali trim level. In all, five trims are available: the Canyon SL, Canyon, SLE, SLT, and Denali. Overall, the Canyon has a boxy, muscular design. The front-end features a large, three-bar chrome grille that is flanked by rectangular headlights. The front and rear fenders bulge out for an imposing appearance. Standard features include projector headlights with LED signature lights and 16-inch aluminum wheels. A newly available All-Terrain Package comes with off-road suspension, all-terrain tires, all-weather floor liners, and hill descent control. The Denali trim has a unique chrome grille, front fog lights, and unique 20-inch aluminum wheels. Under the hood, the Canyon offers three engine options. The base engine is a 205-hp, 2.5-liter 4-cylinder that makes 191 pounds-feet of torque. A more powerful 305-hp, 3.6-liter V-6 making 269 pounds-feet of torque is optional. Both come mated to a 6-speed manual or automatic transmission. Maximum payload capacity is 1,620 pounds, while trailering tops out at 7,000 pounds when properly equipped. 2-wheel drive is standard, with 4-wheel drive optional. The Canyon also has a 181-hp, turbo-diesel 2.8-liter 4-cylinder option for the best EPA-estimated fuel efficiency rating of 22/31 mpg city/highway. It lowers slightly to a 20/29 mpg rating for the turbo-diesel/4WD models. Inside, the Canyon is more upscale than the Colorado, offering slightly better materials and fit/finish. The dashboard echoes the exterior design; it’s minimalist and functional, but there’s also some intriguing technology available as well. The center stack features a standard audio system with a 4.2 display and a USB port. It can be upgraded to the IntelliLink multimedia system, which includes a larger 8-inch touchscreen, an integrated navigation system, Apple CarPlay/Android Auto compatibility, Bluetooth connectivity for phone and audio, 4G LTE connectivity with a Wi-Fi hotspot, multiple USB ports, and a Bose premium audio system. Standard features include air conditioning, power windows/locks, a power driver’s seat, and cloth seating. Leather upholstery, power/heated front seats, and a heated leather-wrapped steering wheel are also available. Standard safety features include a rearview camera, six airbags, antilock brakes, and an electronic stability system. The Canyon also offers several safety technology options, including forward collision alerts and lane departure warnings.